Never has there been another piece of literature as ephemeral and touching as ‘Dear Granny Smith’. With the loss of the traditional ‘Postie’ we also lose a precious part of ourselves. That part that remembers peoples names and birthdays. That part that never fails to bring us news from our loved ones when it rains and when it snows, when its sunny and when its cold. That part that has been there since the moment we are born, that watches us as we grow up, go to school and eventually leave home. That same part that experiences the same joy our families and loved ones feel when we write home. I laughed, I cried, my goodness Roy tells it as it is. I’ve been a postie for many years now and he tells us how it use to be to how it is now, the service is being ripped apart with managers at the helm who have not a clue to what our job is. I still care about my job and my customers it’s just Royal Mail is about money now. Well it’s about time the bosses understand we work for the community that we deliver to not just the company. 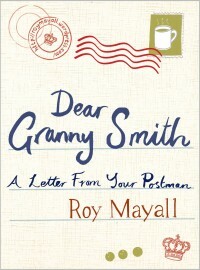 Royal Mail, I would like to thank Roy for the book and telling all how it is, this is worth reading. It will give you all a honest insight into the goings on and what your postie is having to deal with. If you care and use the service protect what you have or else it will be gone! I worked for Royal Mail for thirty four years. I’ve sorted mail, delivered mail, despatched mail, been rained on, been bitten by dogs, pursued by a violent gang of robbers, disciplined for minor indiscretions, stressed out and suicidal at one point. Every sentence in this wonderfully accurate book is absolutely true; it sums up just about every Royal Mail workplace in the country. I know this from bitter experience, as later in my career I left the streets and held a senior union position which afforded me the privilege of representing postmen and postwomen over a wide geographical area. Roy Mayall is someone I met every working day of my life. I’ve also met everyone of his workmates, every customer and every myopic manager, who, if they were honest (or brave) enough to speak out, could testify to the authors account of an industry being relentlessly torn apart. This book is a “must read” for anyone who cares about public service, society, community, greed, and corporate interference. This amusing little gem is a timely reminder of just how much so-called progress chips away at the positive aspects of our day-to-day life and often not for the better. Streamlining a business like the Royal Mail has a human cost. “Roy Mayall” writes an warming and amusing account of how progress can often mean one step forward for the business and two steps back for employees and customers, cutting bonds in our society which have existed for over a century. One signal message for me was that we really do not pay enough to post a letter. For 30 pence a letter makes the journey from one end of the country to the other in a couple of days and in my experience very rarely goes astray – once in 60 years if I remember correctly. Try offering someone thirty pence to deliver a letter for you to the next town and be surprised if they say “Yes”. A very enjoyable read which slips easily into a handbag or pocket. I bought this book this week and read it in an hour or so. As a Postman of 7 years I agreed with every word written. Roy has told the story of what has happened to Royal Mail. It is now a target driven machine with incompetent managers and senior directors running it. They come, do their little pep talk, bang their drum and behold they are gone. The job has changed so much in the few years that I have been working for RM. None of it for the better. This is a must read for every Postman or woman and if everyone who wants to know what’s wrong with the mail – just read this book. You will cry!! If I had the money, I’d arrange for everyone in the country to have a copy of this book. It describes, in a concise and wryly humorous way, the consequences of a purely profit-driven mindset replacing a human-centred mindset. And it could be talking about any of the large organisations (look at the NHS! ), where managers now seem to manage by spreadsheet – and who no longer manage ‘people’ but ‘human resources’ or ‘human capital’ whose job is to follow orders and concentrate on ‘hitting targets’. Well done, Roy Mayall, for telling it how it is – now what can we, the Granny and Grandpa Smiths, do about it? This book is the most accurate account of what It’s like to be a postman. Being a postman myself I can understand the frustration has we fight to keep our much loved postal service in Public hands. We have one of the cheapest and best postal services in the World, but with the present management dogma of cost cutting at the expense of quality, we know where it will lead. This book is witty and honest, even if your not interested in the postal system people will be able to relate to these modern management practises within their own jobs. First class book. I first came across this on radio 4 in serialised form and decided I had to have it in my collection. Very informative, a real hoot, humorously a Sad condemnation of today’s Post Office Management. This should be compulsory reading for every Politician in our so-called Government. I take my hat off to this Author.